You are here: Home » Blog » CDS Middle School Archery wins 8th consecutive State Title! 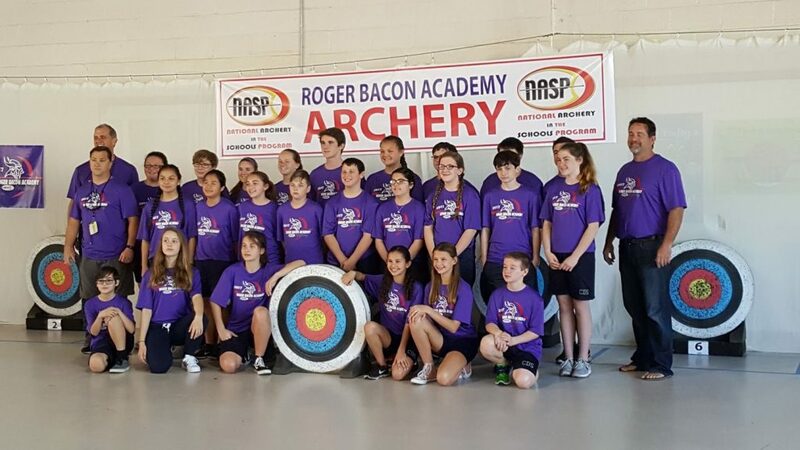 Charter Day School (CDS) is once again home to the top middle school archers in the state, according to The National Archery in the Schools Program, (NASP), which recently released the tallied individual and team final scores for their North Carolina State Archery Tournament. The team comprised of boys and girls in grades 6-8, brought home their 8th consecutive state title with a collective score of 3193 points. Their sister school, Columbus Charter School (CCS), came in second in the state-wide tournament with a total of 2762 points. CDS’ team provided eight of the top-ten middle school female archers in the state with 8th grader Hannah Pelton once again named NC’s top female middle school archer, taking the title for a second year with the exact score that earned her the title last year; 291 out of a possible 300 points. Head coach Daryl Lafave reported last year that 291 is the highest score posted by any CDS archer, male or female, in his memory, so achieving that two years in a row is certainly an impressive achievement. 8th grader Keegan Nance is NC’s top male middle school archer, earning an impressive 281/300. “Archery is a great sport for all students. I have been an avid archer since first joining an archery club in Charlotte in 1962,” said school founder Baker Mitchell. “It is sport that can be enjoyed well after we become too old for tennis or softball, and I congratulate all of these young students on their excellent beginning to a life-long sport,” Mitchell added.